I promoted my cartoons via this blog and where I could remember, I even posted a cartoon or two and what inspired that particular thought (if i could remember). I keep a notepad and pen with me most of the time, especially on hikes. This was suggested by one of my first writing teachers at USM who called it our “genius pad”. I called it “Our excuse for never again functioning well in a 9-5 job again….but I digress. When I think of all my “original ideas”, I would be a total fraud if I didn’t credit Gary Larson’s Far Side for at least some of the credits. That and horrendous reading skills (of mine) left over from years of UN or Misdiagnosed reading issues. 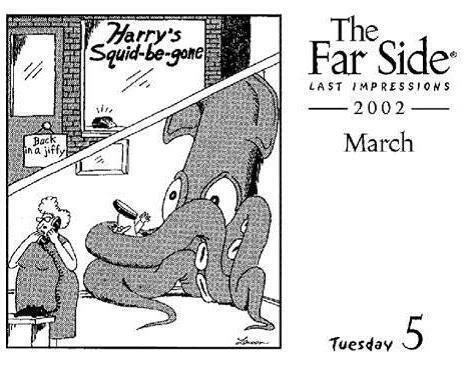 One of my favorite Far Side cartoons was called “Squid B Gone” or something like that. He (Or Universal Press Syndicate) chose it years later the Far Side 2002 wall calendar cover. The calendar was called “Last Impressions”. Fortunately (for my reading disorders), I read it to say something completely different. I wrote it down to be sure to share it with a friend. “No Squid Zone”, have you seen it?”, I asked to any friend who would listen. “Yup…old Gary Larson cartoon…but you got it wrong Rick, It’s “Squid B Gone”. Bingo! Within a year or two “No Squid Zone”, a completely different theme cartoon was born. Though it dealt with a similar issue, “Squid Segregation”, it was far from a copycat. I could rely on my bad reading, bad hearing, and horrible eye to hand motor skills to send me in the right direction every single time. I couldn’t plagiarize if I even wanted to. Hell, I couldn’t even get right what I’d just read, nor remember or rewrite it if I could. And finally Londons Times Cartoons was born (a year before The Far Side shut down in 1997). People sometimes ask if cartoonists have “favorite cartoons” of their own. Many will tell you “No” but that’s not true. Though surely as we look at our own inventory of likes vs dislikes, there are usually a lot more dislikes than favorites. But we do privately have our favorites, even from our own minds. More often than not they are not our most popular ones, and not on merchandise that sells the most, but our own faves of which we were “proud” we could “turn the mind muscle” to create something that absurd. And “No Squid Zone” falls into that category, though it is not a huge seller in the marketplace. Oh well. There’s plenty that I “almost didn’t bring into fruition for thinking them ‘too silly'” that have turned out to be most popular. No Squid Zone will probably remain one of my favorites. Before you say, “Oh, you cheap little copycat”, please note that I had a shoe box full of ideas all the way back from 1973 when I was a student at a Dallas community college of about 2000 cartoon concepts that I’d written, more than 10 years before The Far Side was launched. The sad part is I didn’t have the courage to launch my own, for fear people would fear “they were too strange” hence so was I. Times have so changed. Now the goal is, “Oh man, I hope they think I’m strange enough”. And sometimes they do, and that’s really enough. Rick London is a writer, cartoonist and designer. 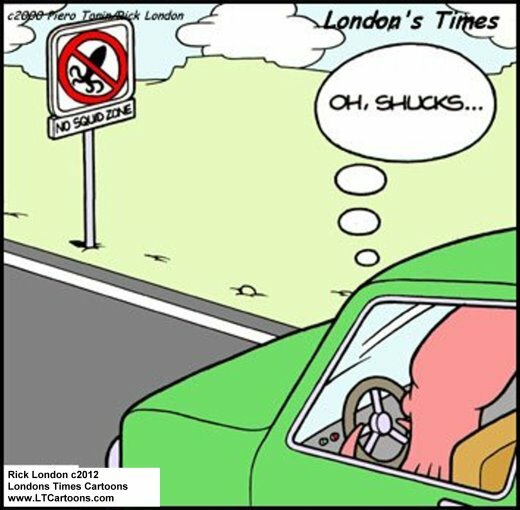 He is best known for launching the number one offbeat cartoons and funny gifts “Londons Times Cartoons in 1997. They have been Google’s #1 ranked offbeat cartoon since 2005 and Bing’s #1 since 2008.